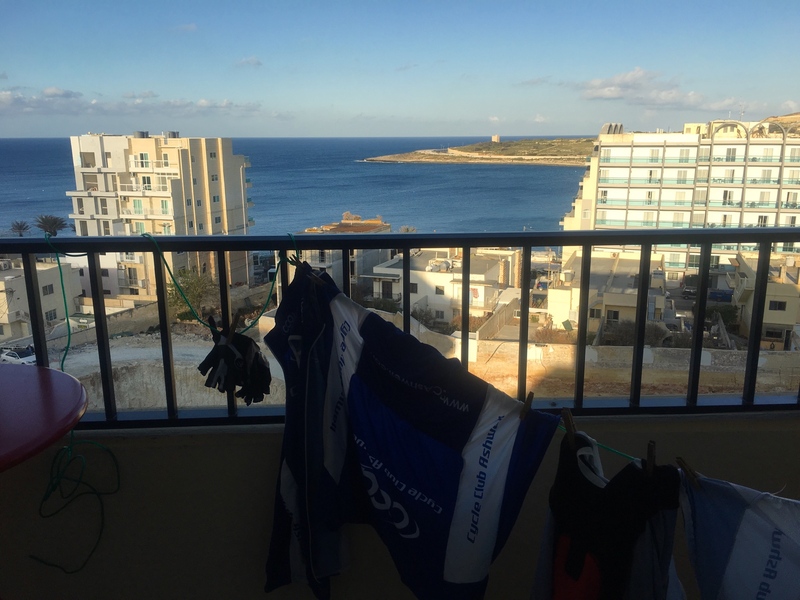 Team CC Ashwell have arrived in Malta all safe and well. Mitchy - riding for Contour Cycles - had a nightmare getting over but he got here eventually. Me, Dave W and Jenny are representing the club. My dad and young Ellie Mitchinson are here in support. 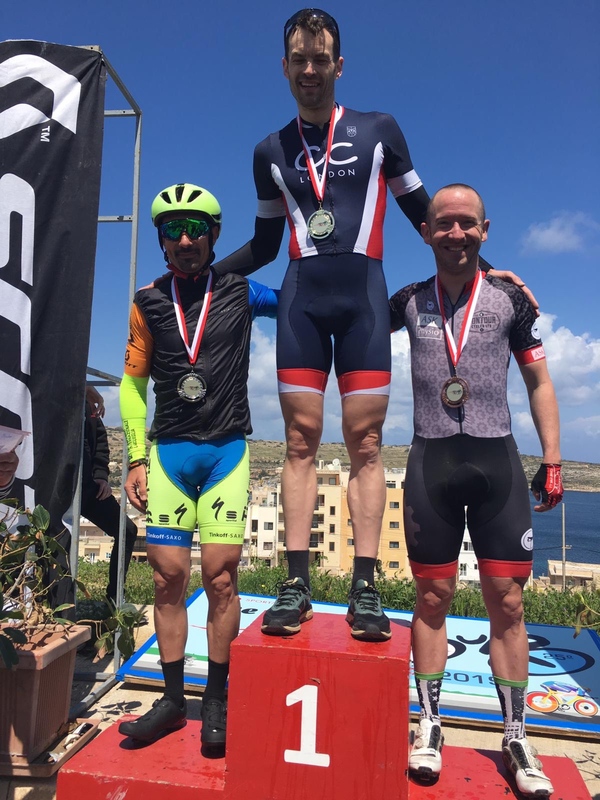 The Tour of Malta is a four stage GC race, registered as a Foreign Race with British Cycling, so hard to earn points for individual stages and overall GC are out there for the taking. But primarily, this is racing at its most enjoyable. 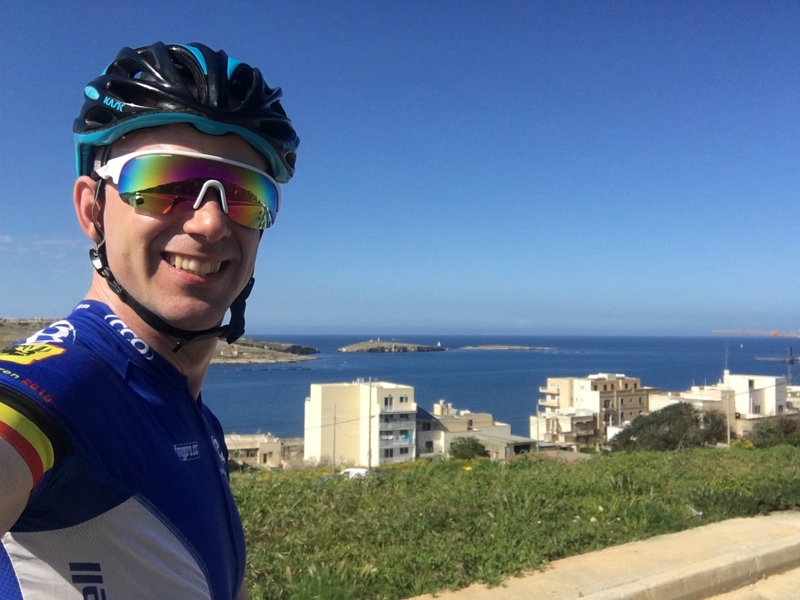 It’s truly a friendly Tour, very much in the Maltese spirit. We are messing around on bikes in a warm country and drinking coffee in between: so we're all winners. Among the registered riders, former multi GB national champ, Colin Sturgess, is in with me and Dave in the ‘Masters’ (40+) GC. A former stablemate of Bradley Wiggins, I fully expect to see Colin's wheel briefly before he rides off into the distance. Go get him Mitchy! I’m staying in the official Tour hotel, so it's nice to bump into others, including Steve and Rachel from Verulam in St Albans. The weather forecast is pretty good. Around 16-20 degrees. Dry. Windy. It’s always windy on these small Mediterranean islands. Malta looks pretty in the Spring with lots of flowers and the grass not yet sun-baked brown. The drivers here are friendly. Just as well, as the major roads are quite busy and some of them are in poor quality. The first stage is a 7 miles TT. I remember it from last year. 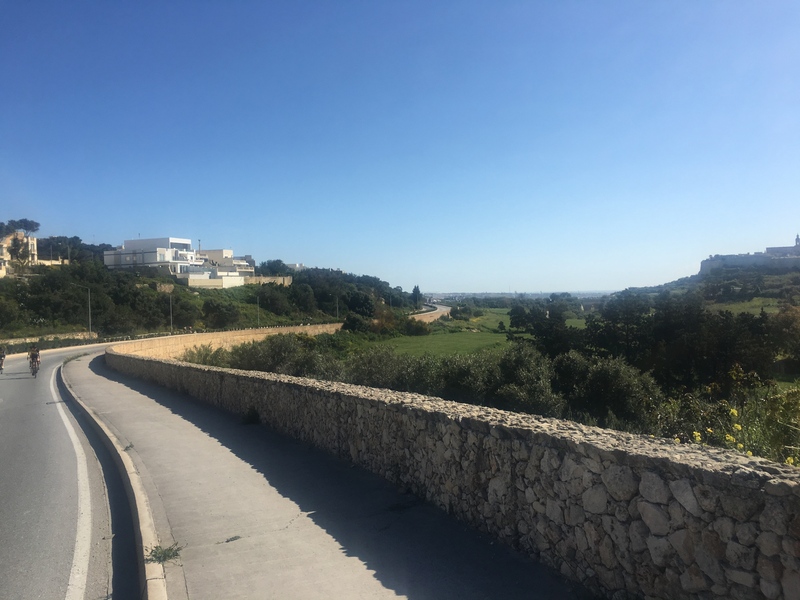 It uses one of the National courses here, up and down the hill several times, besides the amazing ancient walled city of Mdina. It’s a nightmare to get any kind of TT rhythm and doesn’t play to whatever strengths I might have. But that’s the way it goes for us all. Fair enough. After that, there are three road race stages. 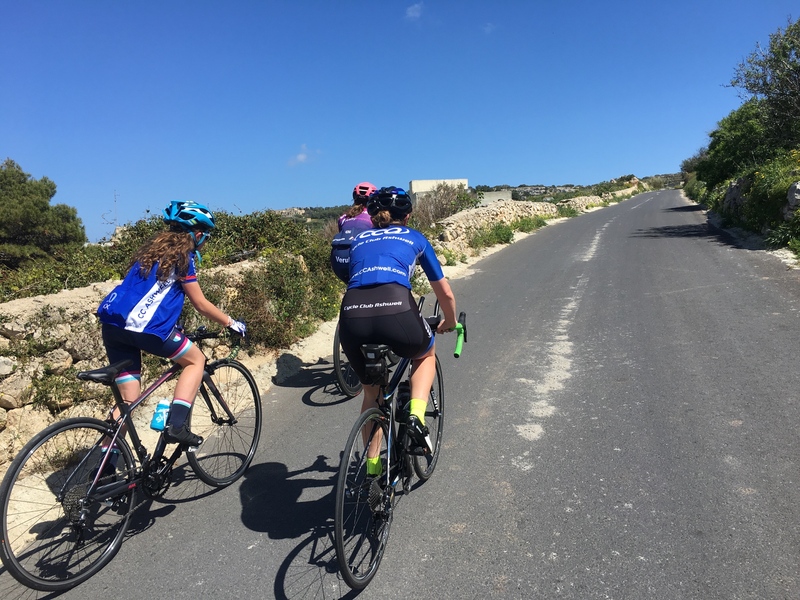 The fourth of which is the one featuring the famous local climb of San Martin: Malta’s mini Alpe d’Huez. We’ll be hitting that seven times. 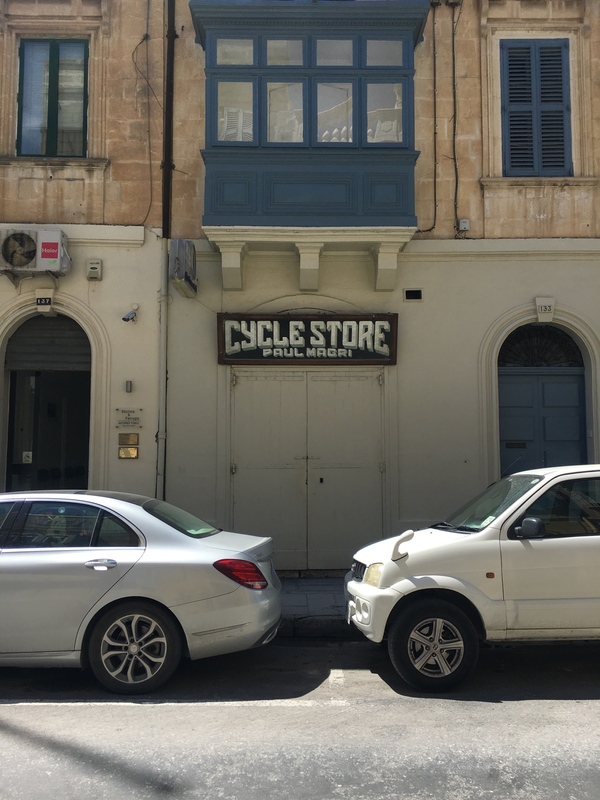 To check my bike over, I rode a few miles to Mosta this morning to buy a pump. Mosta is famous for its massive domed church, where in the Second World War a gigantic bomb landed through the roof but failed to explode. Sending an already ultra-religious nation into overdrive. Hopefully, this big failing bomb is not a metaphor for my performance on this tour. My objective is to simply enjoy it this time. In the afternoon, we all met up to ride gently over to Golden Bay for a coffee in the beachside cafe. Dave and Jenny had a swim in the sea and we tootled back. A leisurely way to spend an afternoon. The climb up San Martin has been partially resurfaced, but up top, the surface is not unlike Paris-Roubaix.This Stage 4 will have a bit of everything. We register this evening and get briefed and find out out TT start times for tomorrow. Then a bit of local pasta and an evening of fettling with bike and kit. I’ve had a decent winter of training by my standards. It’s not at all scientific, but I gauge myself as being just about as fit as last year - so let’s see how we get on. The word is, the Masters field is tougher this year in general. We'll be updating this thread as much as we can. Writing helps pass the time as we don't really want to ride or drink or eat too much to rest in between stages. And the messages of support give us a great boost. Racing day after day for four days is draining. Imagine the pros doing it for three weeks in a grand tour! Finally, where are you all??? If there was ever a bike race to suit Ashwell, it would be this: it has the competitive element and camaraderie of our grass track events... But with sunshine. They drive on the left, use three-way plugs, Malta has it all. Stick it in your diary for 2020 and it will motivate you to train throughout the winter. He also broke the 10 mile national record a few years earlier with the first ever 18 minute ride. It’s still the fastest 10 ever done on a standard road bike, I believe. He had incredible raw power and agression. It’ll be something to tell your grandchildren that you raced with him! Good luck guys, looking forward to hearing how you get on today. Good luck Martin looks great fun and is definitely something I need to consider for next year. It’s warm and calm today. In fact, it’s the hottest day that I’ve raced here. It’s going to be a fast day. Certainly faster than this stage last year in the wind and rain. Luckily, it’s still quite early. All stages start at 10am. 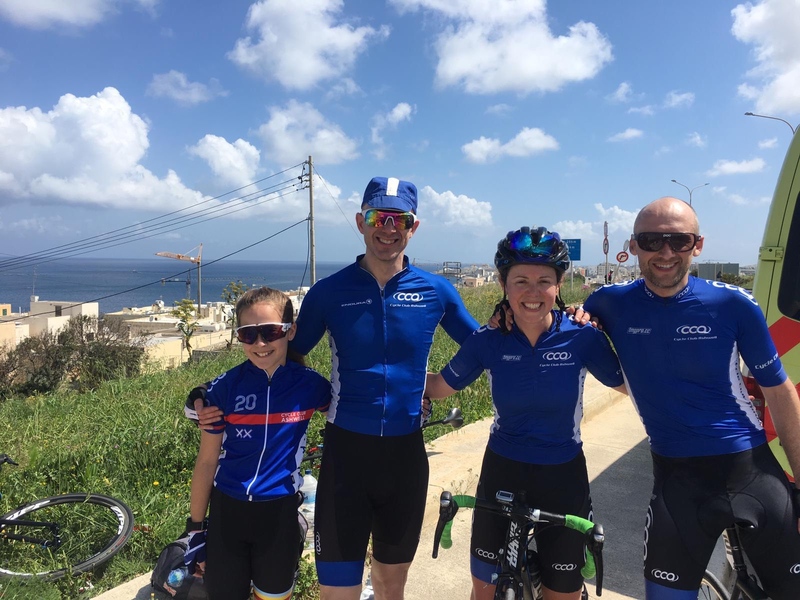 The team muster on a side street off the TT course: which is a modern dual carriageway bypass road, bookended by roundabouts, by the side of the UNESCO World Heritage ancient walled city Mdina, which is not out of place if it were in Game of Thrones. The road is pretty much a straight line with quite a slope on it: think like the gentler part of the slope to Tadlow on our TT course, but around a half mile long. We have to repeat the loop five times for a 7 miles course. 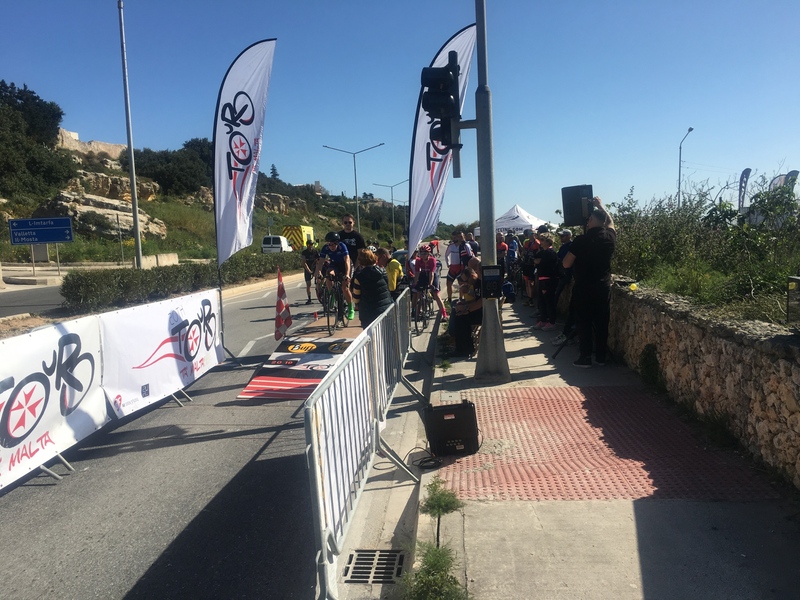 The local teams always turn out in force and set up well: gazebos, pumping music, bottles and gels neatly laid out, rollers, their DSs do a great job. It gives each stage a festival-like feeling. We chat to various people. We spot (World Champ) Colin getting ready. He looks big and strong. 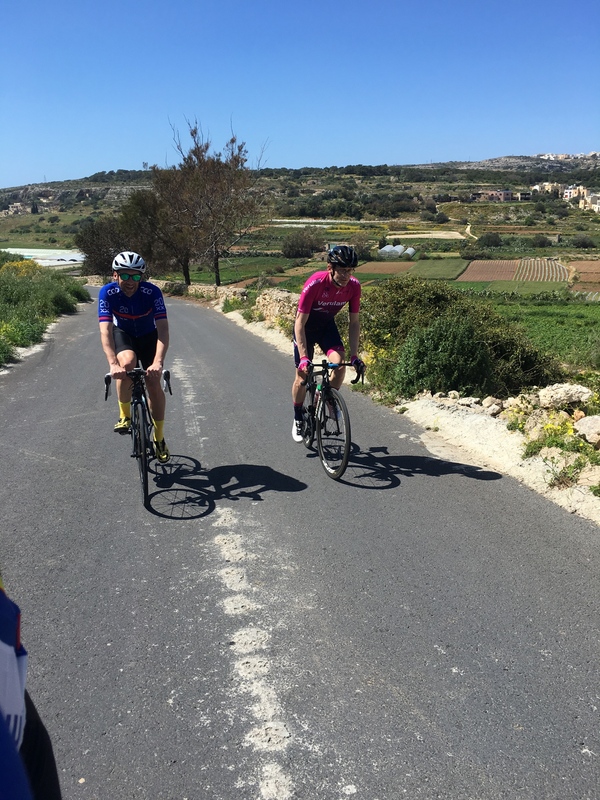 We are friendly with Mosta Cycling Club mostly, so park ourselves there. We see our smiling Italian friend from last year. The Gibraltar team have good team branded kit: I note to up our tour kit game next time. We catch up with a few Brits. Everyone is pepped and excited, and a little nervous too of course and keen to get going. With the road closed, we tootle around to warm up and familiarise ourselves with the loop and test our bikes. I’m delighted to see that last year’s dodgy eroded part of the road is well patched up. At the bottom corner, there is a lot of debris. Daryl, from CC london who we have adopted, asks the organisers to brush it, but I take the opportunity to remove the big bits while down there. I pick up a twig, then realise it’s a squashed giant centipede. As big as your big finger. I’m reminded that we’re not that far from Africa and Libya. Team Ashwell and Contour prep well. Everything is easier when the weather is good. I've removed my bottle cage. Put on rubber aero socks. I’ve got tri-bars on which means I have no computer to look at, but actually don’t mind that: I intend to not use numbers - but riders - to gauge my effort and define my power exertions. Jenny is the second rider off. Before you know it she is up and down the loop like a yo-yo. The start/finish is in the middle of the course and we get a good opportunity to cheer our team on twice a lap. Soon enough Dave is off, then Mitchy is off just in front of me and Daryl a few riders behind. The good conditions mean we get the ramp start. Quite a nervous thing as there’ll be instant gravity in effect from the moment you’re released: you go hard instantly or you’ll slide off. “Watch this one, he’s Lawless. 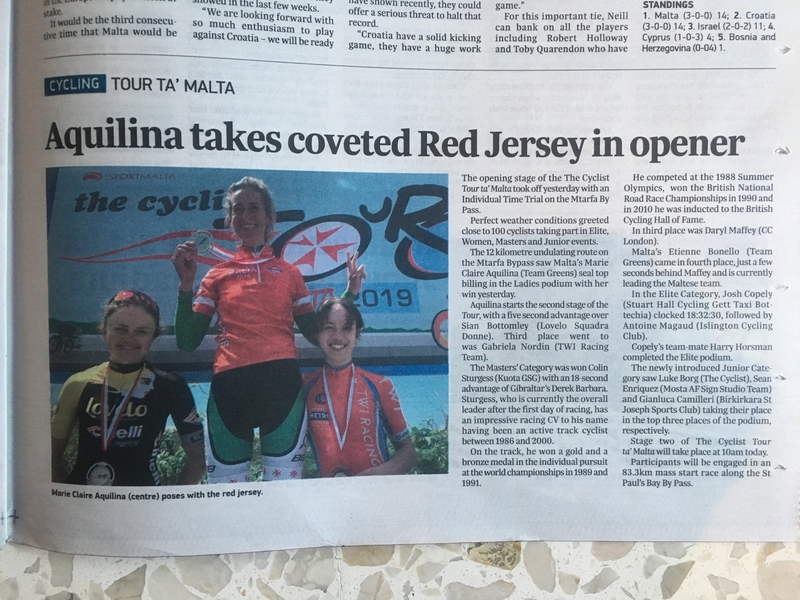 Breaking the law.” say the organisers in thick Maltese English, fascinated by the surname as I’m counted down. Three two one. Go. I’m off. Despite the initial climb, months of stockpiled adrenaline from thinking about this start is released in an instant and I go off like a rocket to the top of the loop in what feels like three breaths. This course is technical in as much as gear selection is everything with no level section. I turn and go down in a high-ish gear not really knowing if I’m being optimal. The legs instantly hurt. To be expected. I can feel a soft wind in my face going downhill and think it will suit me as it will inhibit the power guys who can smash me on this section. I turn quite confidently in the good, bone-dry conditions and break the imminent uphill down into parts: an easier first bit until the fifth lamppost and then a hard gear on the steadier section in search of a good rhythm before nudging back a touch for the steeper peak and then turning for the downhill again. I count each lap out aloud to myself when going over the line. Without a computer I have a small fear that in the midst of the effort I’ll ride too few, or too many, laps. I can’t yet see my minute-man, but on the second lap, Daryl goes past me on the downward section like a rocket. I know he’s good but all the same am impressed he’s caught me so soon. I’m delighted, all of a sudden I’ve got a perfect rabbit to chase after: someone better than me. It really focuses me. On the uphill, Daryl is surprised that I actually overtake him, such is the difference between my uphill and downhill power outputs. But I only serve to galvanise him and 20 seconds later he’s back in front. But this is good for me and I can sense I am pushing hard as I’ve got quite a stitch now and breathing hard. The air is hot. I move to my highest gear on the downhills to try and keep sight of him. It’s super hard and hurtful: but I know it’s short-term. By lap 4, Daryl is too far ahead to be any use as a marker. I’m motivated by my team mates’ cheers and picking off the various riders on the course. 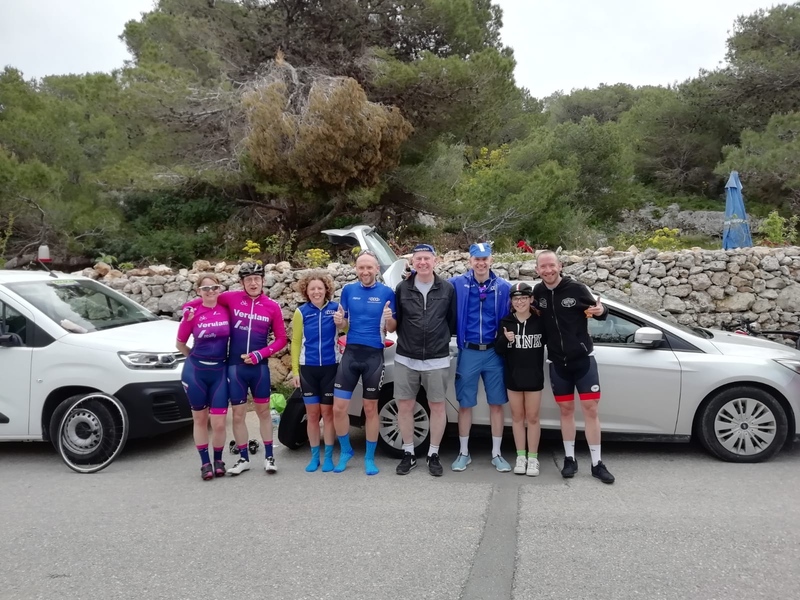 Some are way off any TT form: but credit to them for turning up on a working day and having a go and enjoying themselves. Into the last lap and I spot my 2-minute man. He makes a good target, but eventually I catch him with three-quarters of a lap to go. It’s the downhill run and I’m like John Noakes in that Blue Peter episode when he’s training with the paratroopers in a plane in high-up thin air and he can’t remember his name or the name of Shep. I endeavour to glance at the big digital clock at the start line, on the other side of the road as I go past - because I start to doubt myself on how many laps I’ve done. It tells me I’ve got exactly two and half minutes to cross the line if I want to break 20 minutes. Righto: I’ve got one final thing to aim for to make me push hard in the final run in. Out of nowhere, ‘Safety Dance’ by Men Without Hats pops into my head. It’s a song I know is very short and just over two and a half minutes long as it took a tiny amount of space on my Now That’s What I Call Music album. I hurtle down to the bottom of the course with ‘We can dance if we want to...’ going through my mind. I turn for the uphill and happily go into the red in the knowledge I can blow up over the line. ‘Am I in the second chorus bit?’ I think to myself as I see the finishing line coming up. ‘It’s the Safety Daaaaance’ I can hear as I make out Jenny urging me on on the line. Surely there’s still some of the song left? - I think as I blast over the line and glide to a stop where Mitchy is recovering by the side of the road. 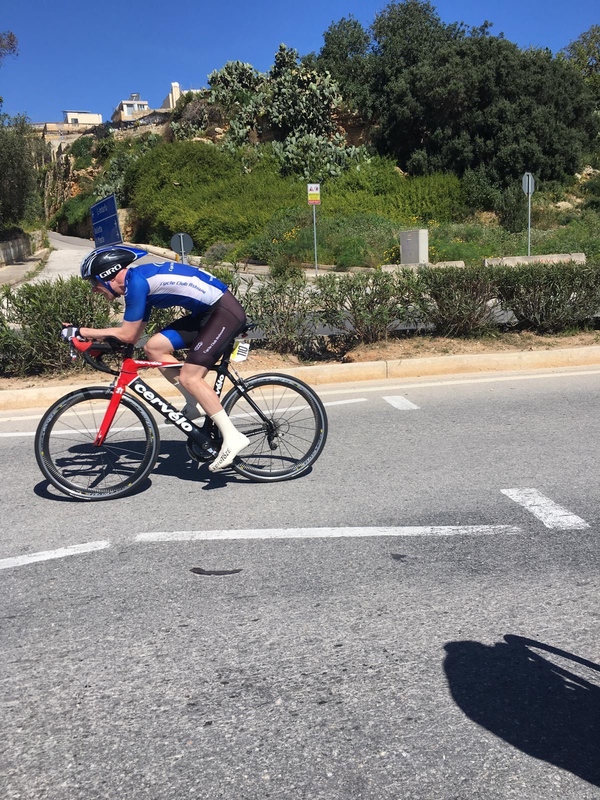 We stumble back to the start, sweat is dribbling down my face and my uncomfortable TT helmet is about to get thrown into the cacti as I find out that I had broken 20 minutes with 19:46. Happy days! There’s a short wait for all the Masters to complete their rides to find out I’d come 8th. I’m delighted. 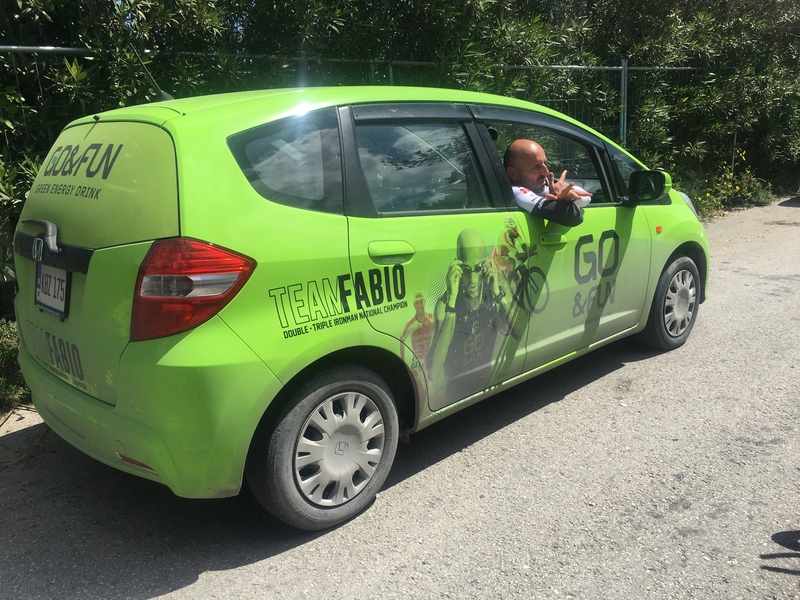 I’ve beaten local sports legend Fabio by 3 seconds, who has his own branded car with his face on it and ’Team Fabio’ written on it and everything. Dave W is 15th and Mitchy 6th. Jenny is 7th in her race, smashing the gap to the winner from over two minutes last year, to just 40 seconds. Wow. So, great results for us all considering the quality of the field. Of course, Colin Sturgess wins the Masters. Indeed, his time beats the winner of the Elites race. Wow. He will be hard to undo for the GC race in the next three road stages - that’s for sure. It will be great to be involved as things unfold. Daryl gets 3rd and takes the podium after we have a drink in the most delightful cafe nearby that’s utterly hidden away from anywhere. So, we are now prepping for Stage 2. A hilly crit near the hotel, essentially. We’re all unsure as to how the dynamic of the peloton will work out: if it will break? More than once? Who’s where? How everyone will place and how it will affect GC? These are the thoughts I will take to my 10 euro buffet hotel dinner downstairs. Awesome results, write up and pics. Well done all. Good luck with stage 2! Well done guys. I'm enjoying the reports. as Stef. says...great write-up.Have fun in the sun. Last year, this stage got cancelled. It’s on top of a big hill really near where we are staying and totally exposed to the weather. It was so windy it wasn’t safe, and some club gazebos and the podium blew away. This year: it’s much better. It’s a bit cooler this morning than yesterday. Mainly because of the stiff breeze coming in from the sea. But it’s fine. Sunny. This stage sends us up and over the road seven times. Each side is a bit like the climb up through the Weston Hills tunnel Baldock bypass road: about as long as it takes to get to the roundabout at the top and yes, pretty steep! We make our base at the start/finish line at the top of the hill, sign on and prep. I realise I’ve left my aero socks behind, so will be racing in my bed socks that I left on all morning. Other than that, we’re all good. We are all thinking a one bottle strategy as this race is only 26 miles or so. I need to think carefully about this for the fourth stage as I drank much more than anticipated in the warmth and ran pretty low towards the end. We wonder what Colin will do who is in the Red Jersey following his win yesterday. The Elites start first. 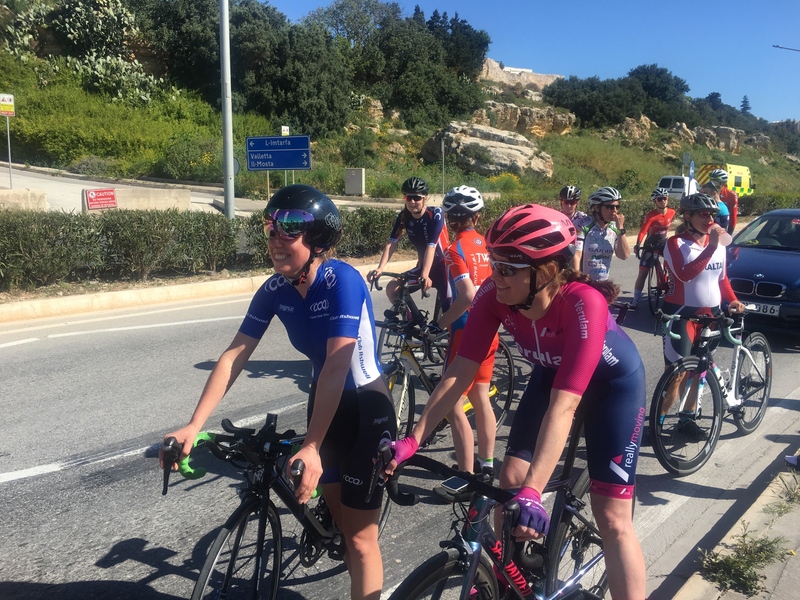 Then us in the Masters and Juniors races, then the Ladies race, with Jenny looking to improve on her last time here two years ago when she got dropped from the peloton. We’re off. We take it fairly easy at the start, as to be expected. The first climb is almost like a warm-up. Everyone is settling in and it’s a bit cagey. The riding standard seems pretty high and there doesn’t seem to be any wild antics from anyone. Up, we crest the top and get cheers, then lurch down the steep winding west side of the hill into the wind. It’s a fairly tight turn on both sides. My new brake blocks squeak to let me know they’re working. We turn to climb back up east. This side is steeper. I resolve to keep it in the big ring all the way - but am in the granny ring at the back. The angle suits me and find it OK to stay at the spearhead of the peloton. All eyes are on Colin, waiting to see what he does. First lap done though and he keeps his cards to his chest as we descend to start the second lap. It starts to crank up from here. Eventually, Colin shows a bit of his strength. The group respond. A few Maltesers have a go but are brought in. 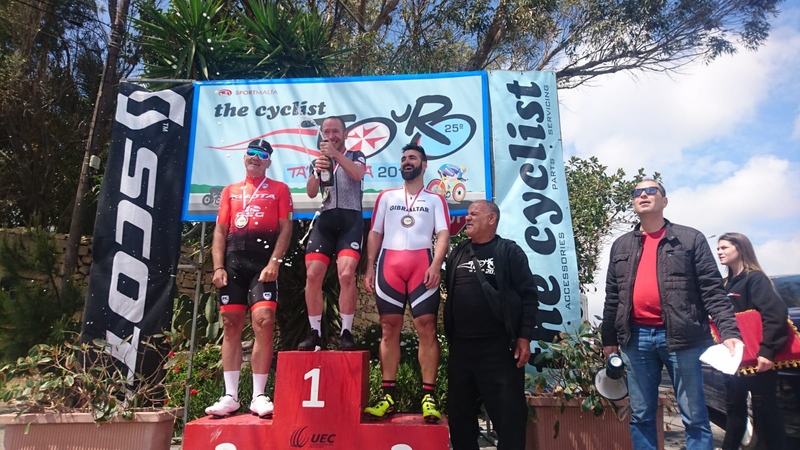 The big Gibraltarian who smashed the TT yesterday has a dig. I’m impressed, he’s a big powerful unit. He must have lungs the size of a blue whale. 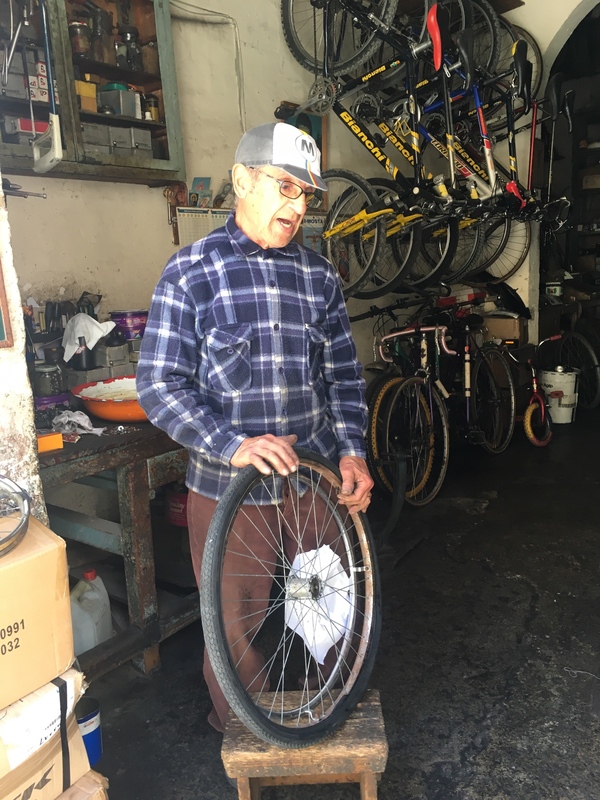 It’s great to have Steve from Veralum around whose wheel I can trust. He’s a very animated rider and nosing around at the front a lot. I’m just being careful and being really quite disciplined on positioning among the riders and tuning my position to shelter from the breeze. The climb east is hurting some riders and I can hear it getting quieter at the back. I can see Dave W is over his bike in a way to suggest he’s in the red. There’s nothing I can do to stop the momentum of the front and eventually I catch Dave in the corner of my eye when he’s detached with a couple of other Brits who are forming up a second group. Colin and co are doing that thing of putting the hammer down as we crest the hill so that there’s no respite. I’m holding on OK all the same, as are Mitchy and Daryl. We begin to tonk it down the long descent, comfortably holding 38mph until we squeak brakes, turn and generally take it easyish for the climb. The group puts in pulses of effort and I can see we are shelling riders. Soon, I see its down to twelve of us. Of which, I’m very much in the lower ranks! I ride alongside Colin. He’s a strong looking fella. I get the sense he could do us all if he wanted to. But hasn’t really done so yet. In a lull, Daryl goes for it and pings off the front. On his wheel an Italian I’d not really noticed before. 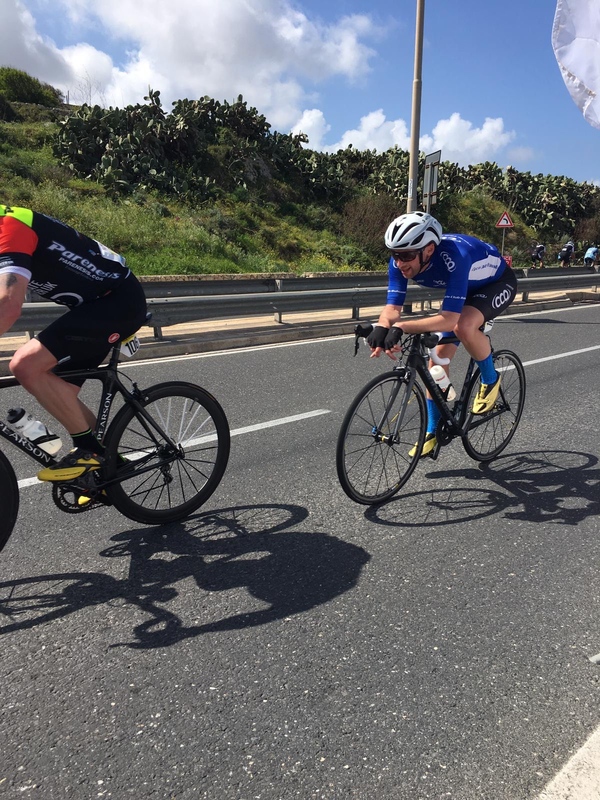 Daryl and the man from Milan quickly establish a gap of several seconds. The rest of us look to Colin who is watching his Red Jersey disappear. But there really isn’t a response. I can see Mitchy isn’t in the mood to chase his friend, or risk doing a lot of work on his own and blowing up. As we approach the last two laps, it’s clear that the break won’t be chased down and the two brave breakaways will get first and second. Well done to them for their bravery. So, back in the bunch of ten, it’s going to be a bunch sprint for third place onwards. I really don’t want the last two places and be out of the BC points in eleventh or twelfth. I also want to preserve my GC position too if I can. It’s the bell lap. It’s laughably slow on the initial climb. I even find myself on the front for the first and only time here. Me: in front of this group. lol. I get a bit irritated after a while as no one will take the front off me, even though I'm doing that snakey whiplash thing across the road to shake the front. Then, Mitchy bursts through to ripple the group and I’m relieved of duty. We shoot down the other side and turn for the final climb. I look to see if somehow we’d dropped anyone, but alas, two people will miss on points here. I’m feeling pretty good as we climb for the final time. I tell myself I can do all right and spin in a strongish gear near the front. We get down to the final 200 metres and there are several riders dropped from the Elites race in the way ahead of us. It’s a bit of a mess as we lurch into the gallop and I miss out on having a decent clean sprint. It’s eyeballs out. As we approach the line, I see Fabio in front who I have 3 seconds on in GC and focus on his wheel. Another 25 metres, I might have caught him, but he beats me by 0.5 second. In the cheering and melee, it’s hard to count my position, but I’m excited to think I got 10th. Mitchy beats Colin in the bunch sprint to get 3rd. Veralum Steve gets 7th. Daryl gets 1st by over 40 seconds and we work out he’s taken the Red Jersey off Colin by around 15 seconds or something (GC positions unconfirmed at the mo) I wander to the race HQ and see I’m confirmed as 9th. I’m delighted. We gather and swap stories. Dave and Ellie go for a photo with Colin and he gives Ellie his cap! Jenny comes through for the Ladies race finish. She’s in the lead bunch and grabs 6th. This is proper amazing when you consider she got spat out on this same race two years ago. She has transformed herself in that time. Dave, working with the Brits, comes in 17th. I’ll be keen to see that he has kept or even improved on his GC position. This afternoon, Jenny gets a massage. Mitchy and Ellie go to the beach. We catch up with Dave for a coffee, and then spend ages cleaning kit with hand wash in the bathroom sink. It’s Friday night. But all revelry is to be bottled for Sunday night. Stage 3 tomorrow is designed to give our climbing legs a rest: it’s a flat crit. Surely it will be a bunch sprint. Will it? Will it?? Or, will it? 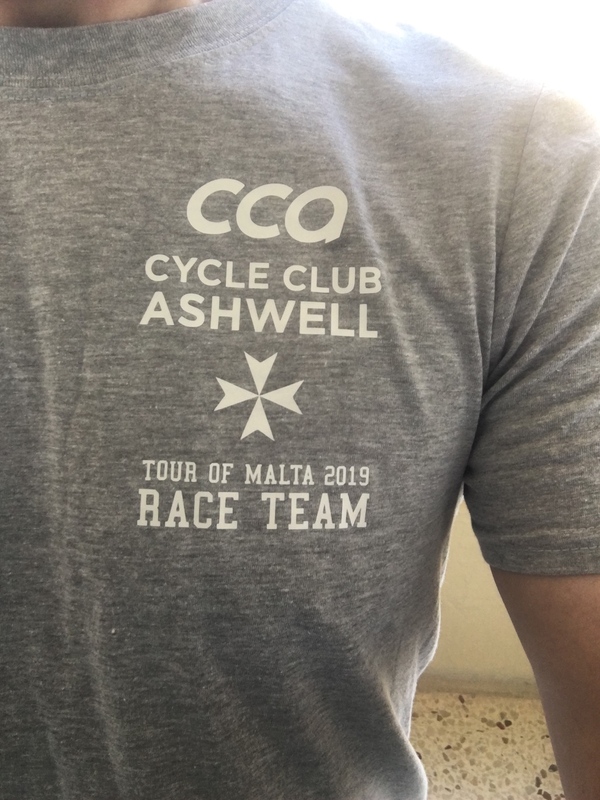 Tune in tomorrow for the continued adventures of Ashwell racing abroad. AWESOME! Hooked for the next installment! CCA chaingangs start Tuesdays evenings from 23 April. CCA TTs start Wednesday evenings from 1 May. Fantastic efforts all round - keep going! A page turning read, Martin. Cheers for doing it. Can’t wait for the next thrilling instalment. Great to hear everyone’s progress. Keep it up boys and girls! Today was a flat, super simple crit. 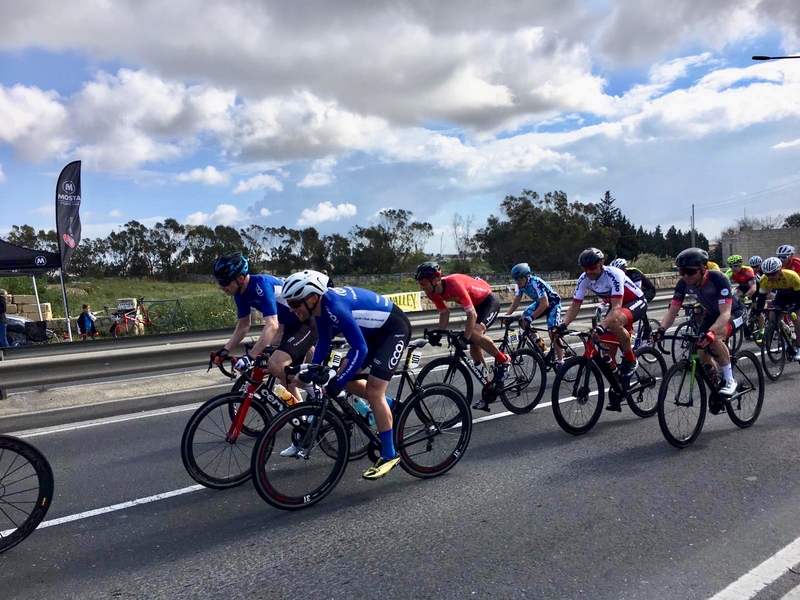 It’s designed to give the legs a break after yesterday’s hilly road race - and in anticipation of the fourth and final stage: the San Martin road race stage with its steep climb. The course is quite far away from the hotel base and in the middle of the island. In truth, the straight lined course does tilt. Gently so, but with a fierce headwind on top, today wouldn’t have the simple rhythm that could have been expected. It would swing from steady to bullet fast - depending on head or tailwind. We would do 10 laps of the 2.6 miles course in the Masters race. As would Jenny in the Ladies race. The wind made the weather feel fresh. It was sunny, but there would be very light showers now and then all morning. Most of this race went as predicted. Any idea of a break was impossible to imagine. Dave W was clearly loving his favourite course ever - and happily burning watts on the front during the fast tailwind side. There were silly solo attempts, including one by Fabio who I have to keep in check as I only have 3 seconds on him in GC. I think he just wanted to give the fans something to cheer for a little while. But we hauled him in soon enough. At one point it was all Hertfordshire and surrounding areas on the front, with me, Dave, Mitchy, Daryl and Steve from Verulam in a line. Indeed, we were always generally knocking around the front or thereabouts. 10 laps is hard to count accurately what with everything going on. What doesn’t help is when the lapboard gets out of sync which I’m fairly sure is what happened. We thought we were approaching one lap to go, when Colin’s team mate launched a late attack - in an obvious attempt to lure us and give Colin an opportunity to spring the trap. But we brought him in eventually quite easily as we had further to go than thought. As we approach the final lap, I hear the sudden bang and hiss of a puncturing tyre. Sadly, it turns out to be our Dave. Rotten luck - especially when he’d animated the race so well. He’d hit a pothole at high speed. 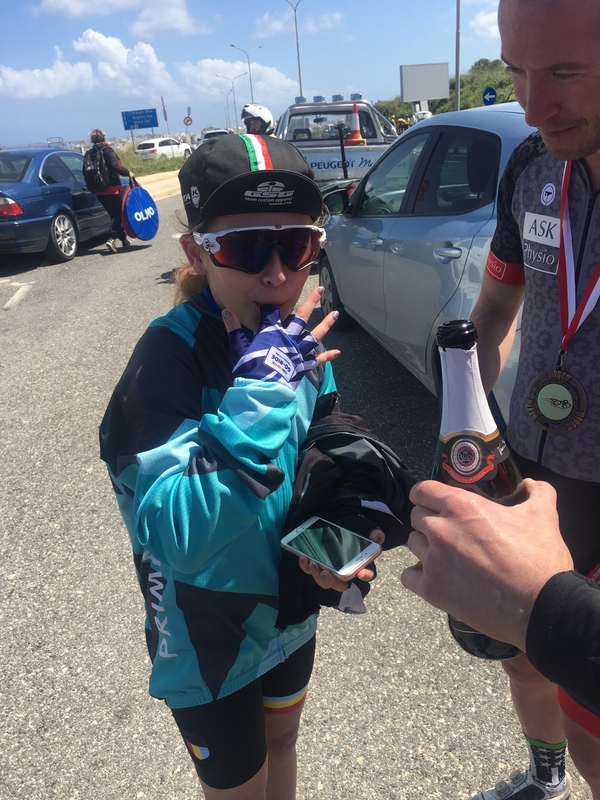 To his massive credit, he runs to the Start/finish line where young Ellie Mitchinson is waiting with a spare rear wheel. He’d lose a good couple of minutes from the rest of us, but finished and still holds on to a good chance of clawing back up the GC in Stage 4. Meanwhile, back in the bunch, it’s all winding up to the big sprint finish we’d anticipated. This would be one for the sprinters. Without the ability to compete, my plan was to go long and build up momentum. 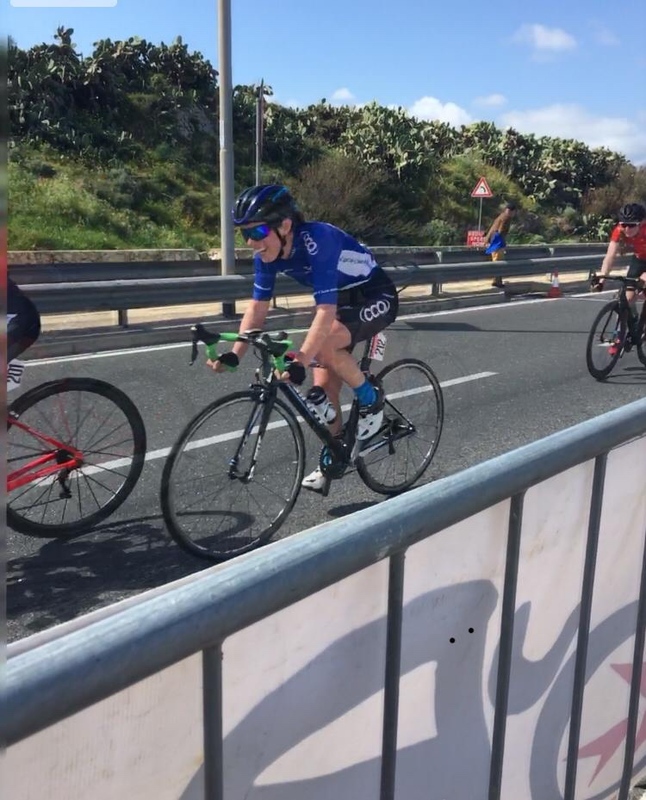 Weeks and weeks of road race training all winter with all the talent down at Welwyn had taught me that if I can make the sprint over 20 seconds, I begin to compete and negate the power of the fast sprinters. As we turn the final corner, there’s a lot of hustle and bustle. A few shoulders to shoulders. Mitchy touches wheels with Colin - and quickly apologises. This bit is not for the faint-hearted. Some riders back off. But, I’m loving the rush. I’ve got my eye on Colin and Mitchy and plan to jump into the gap they will leave when they fire the afterburners. The line is fast approaching and I can hear the shouts of support. It cranks up early as I’d hoped and indeed I seize the gap. I’m clear on the right and have a delightfully clear dash to the line. I can’t hear riders huffing behind me but quickly running out of road to do more damage up front. I’m 8th. Mitchy: wins! Beating Colin by a handsome margin. Daryl in the Red Jersey is on my left in 6th. Verulam Steve is 10th. He’d have placed higher for sure but did way too much work on the front earlier on. We cruise around and congratulate each other for a good race. I tell Colin how impressed I was by his racing style: so bullish and confident. We get back to see Jenny finish. 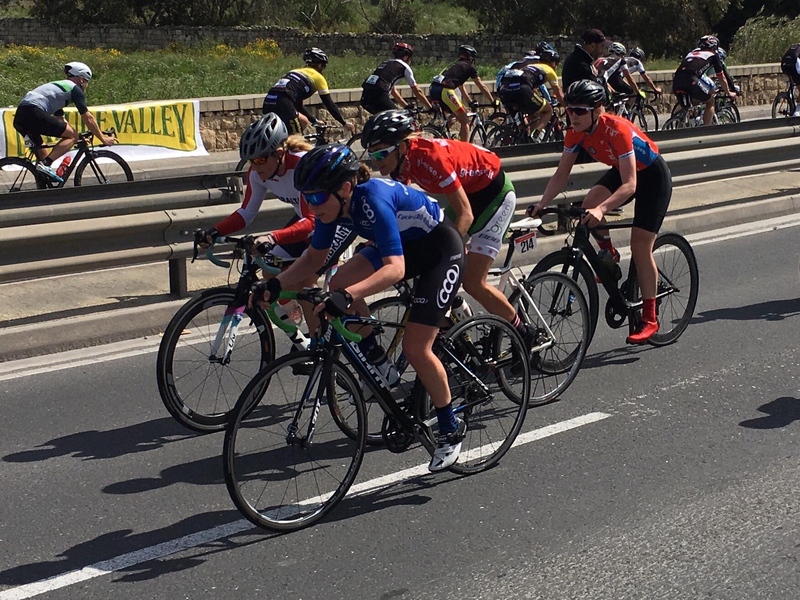 She’s in the bunch chasing 2nd place downwards, and comes in 7th. She is frustrated as other riders lolling after their race got in her way and pegged her sprint. It’s a shame, but still a massive result. She’s got no team mates and fighting on her own all the way, all the time. We reconvene and swap stories as we wait for the presentations. It’s great to see Mitchy get a win and pop the champagne on the podium: all in front of his daughter. Daryl retains the Red Jersey. It will be an exciting final stage as a final race, and in GC it will be a great game of chess. A lot can change. Friendships, pacts and allies will be made, then turn on each other. We will be doing calculations in our head to work out time gaps. There will be competitions within the competition. There’ll be heroes, villains, good fortune and cruel fate played out on the winding slope of San Martin hill, its vertiginous descent towards the sea and the crazy fast tailwind valley, repeated seven times. The French say ‘Allez!’, the Maltese say ‘Imshi!’. Great stuff. Love the commentary by Ellie. I don't know what I'm looking forward to the most tomorrow, the final stage report or Paris Roubaix. Loving the updates Martin, good luck for tomorrow. Tempted to have a holiday in Malta next year. Great stuff team CCA. Good luck with today’s grand finale! Stage 4. San Martin. 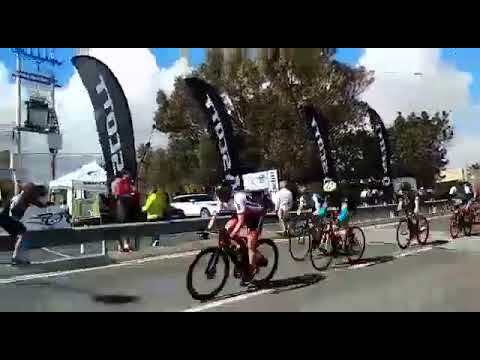 Road race. In GC terms, this final stage is the decider. Forget what has gone on before. The San Martin race course is famous here. It has three parts: a vicious, long climb. With a much needed switchback. It varies from not very steep at all to out of the saddle steep for a mile or so. It levels off at the top for a flat fast section before turning for a fast descent on new tarmac. We then turn for a ridiculously fast flat road section through the valley until we start the climb again. For us Masters and Ladies races, we’d do this six times. The day was pretty fresh, but very warm in the sun. A lot of riders were nervous about this race, though I was pretty calm. I was quite philosophical about everything. What will be will be. Off we go and Dave hits the front for most of the first lap. It’s steady enough, though I feel my legs are tired. I’m a bit surprised by this and wish I’d done some massage work. We turn for the first climb of San Martin. One of the Italians, Gerloamo, pings off the front straight away. There’s an initial lull as we don’t think the guy is a contender. Then, there’s a surge. Led by another Italian, Tommaso. On reflection: this was a pre-planned Italian move. The weaker guy (not that weak) getting a head start before the stronger guy then stretches the group ensuring both make it. It’s the first climb, and we are absolutely and suddenly in the red. We are attacking on a massive slope. This is outrageous riding. I know that we’ve instantly shed riders and the race hasn’t even done a lap. This is brutal. Like organ failingly brutal. Seeing stars. Can’t feel my hands. Can’t think. Breathing like a steam train. This is the fastest climb of the hill I’ve ever done, in the smallest group. I cling on as the climb stretches out and try and hold onto the selection at the top. 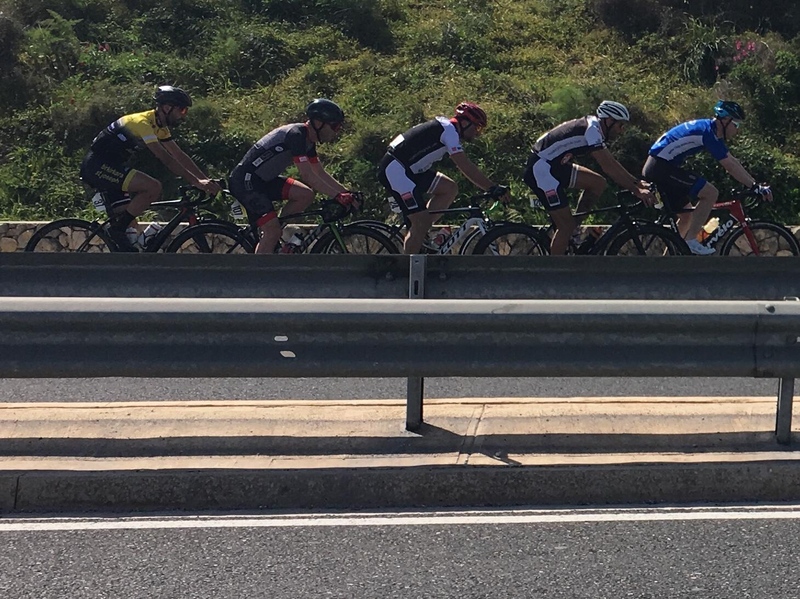 I almost make it, but six guys make a few bike lengths of distance, including Mitchy, Daryl and Colin, while I’m with Verulam Steve and six others in group two. By the time we approach the descent, there’s not enough firepower into our group to bridge back and we have to work with what we’ve got. That’s not to say things got easier. The GC factor kicks in. This second group is aggressive too. Derek from Gibraltar wants to keep his high place. Fabio wants to do me in. Steve knows he can climb the ranks. The second climb of San Martin is equally devastating. Steve, a rider considerably better than me, records his highest power 5 mins, 15 mins, 1hr and 90 minutes on this race. I mirror him so will have likely done the same stats. We spin like mad to the top. I don’t know how I do it but I keep with the second group. I keep thinking that I've come all this way for this so am not going to give in. We drop big Derek, but he fights back. I really know we are burning watts: when we catch and pass the Elites race! They started two minutes ahead too. It’s a mess, but we get through them. This race is nuts. Again and again we go up. It’s super hard. The Elites peloton eventually passes us on the climb. Fabio jumps on to the back of their bunch. A probable DQ in Britain, but acceptable here. He disappears out of view and I know I’ve slipped down a place in GC. At the top Derek puts in a great effort. I can’t believe his power: he’s a proper unit but can do the climbs too. Amazingly, he solos off the front and he too consolidates his GC position when I least expected him to do so. So six riders up front, plus Fabio and Derek in between us in the second group, means we’re fighting for 9th place down. We enter the last lap, I lob one bidon and squirt all but a swig of liquid from the other. Grammage counts now. As we climb San Martin for the final time, I actually feel pretty good. I take to the front with Steve and get into a rhythm. I can tell somehow that i’m hurting the others. No one is coming through and it’s very quiet behind me. We approach the line and Steve takes a lead. I hold his wheel but I can’t get past it and to be fair: he’d done so much work on the front, I'd feel bad if I nicked him on the line. Steve gets 9th and I get 10th. Despite the pain: a single BC point for my efforts. All good. We are all breathing hard, but soon recover to chat. 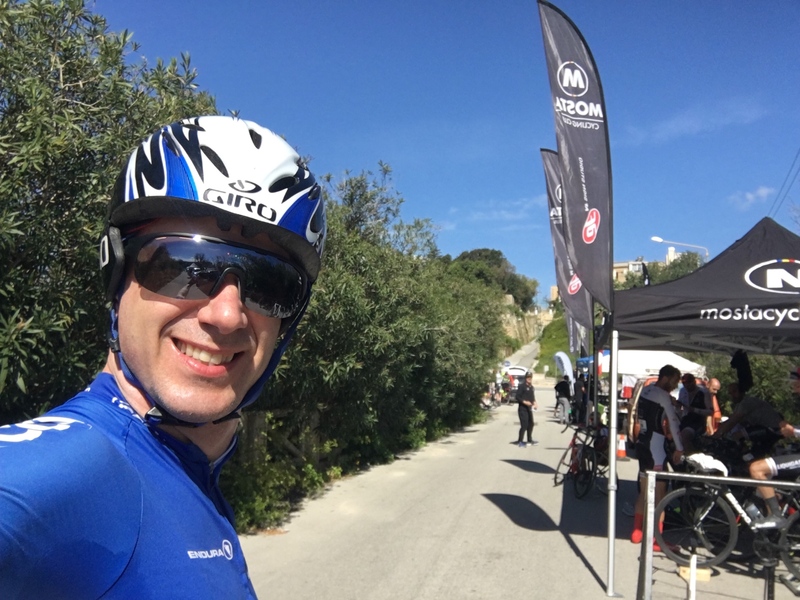 Fabio gives us all respect for holding on to the second group, and my nemesis Ivan from last year is very friendly and kind and says he remembers me from last year and is impressed with my improvements. I was in awe of everyone: this race was a brute to take on. Mitchy gets 5th from the front group. Colin wins the stage, but Daryl preserves his Red Jersey and we get to see him on the podium to celebrate his GC win. All of a sudden, it’s all done. The trophies are handed out and we make plans to watch Paris-Roubaix in the hotel bar with everyone. 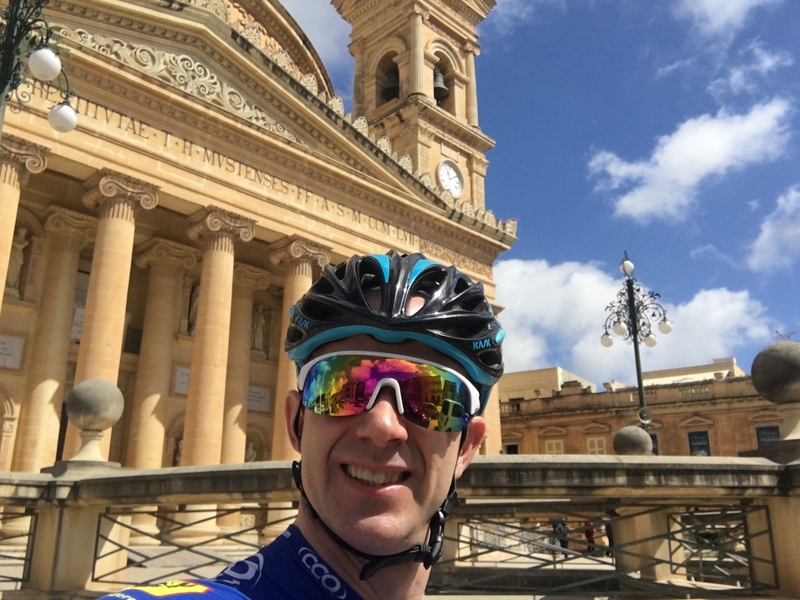 Johnnie, the MCF president and main organiser, has a tearful moment while wrapping everything up, having had the chance to meet the Pope recently for all his efforts to promote cycling in Malta. It’s a big deal to this highly Catholic country. Jenny comes in 7th on her race. Another great performance on the front bunch. She really has had a strong Tour: up there and in the mix at the tip of each race. 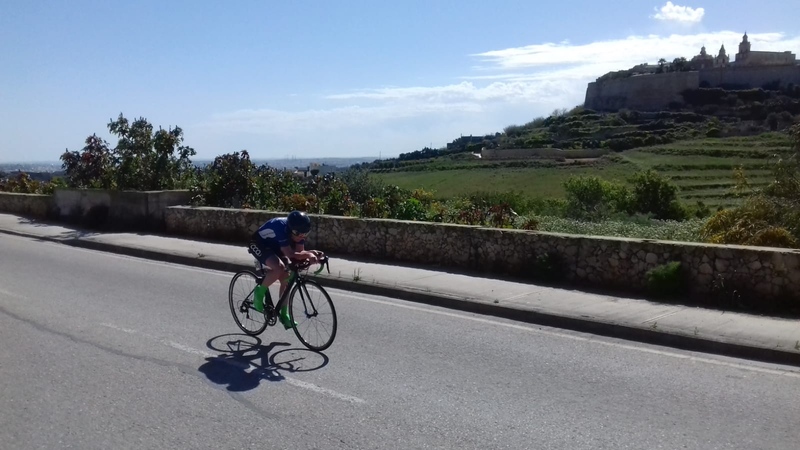 Dave comes in around 20th in a third group, along with a couple of friendly Colchester lads who thought Malta would be a bit like Majorca. 10th place today, and 10th in GC for me in end. A very successful trip, especially when the quality of the field is accounted for. 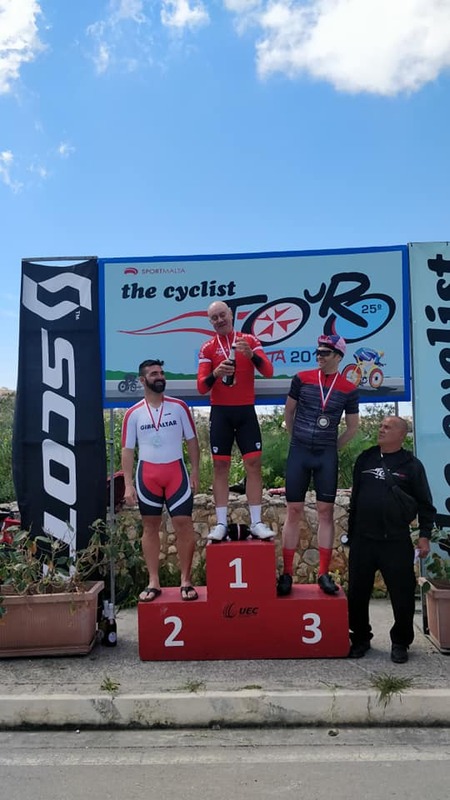 The Tour of Malta has awarded me I think 12 BC points. Half the total required for preservation of 2nd Category status. I can’t wait to hit the grass track and score more. Thanks to all the team here and for all the kind words here and on social media. 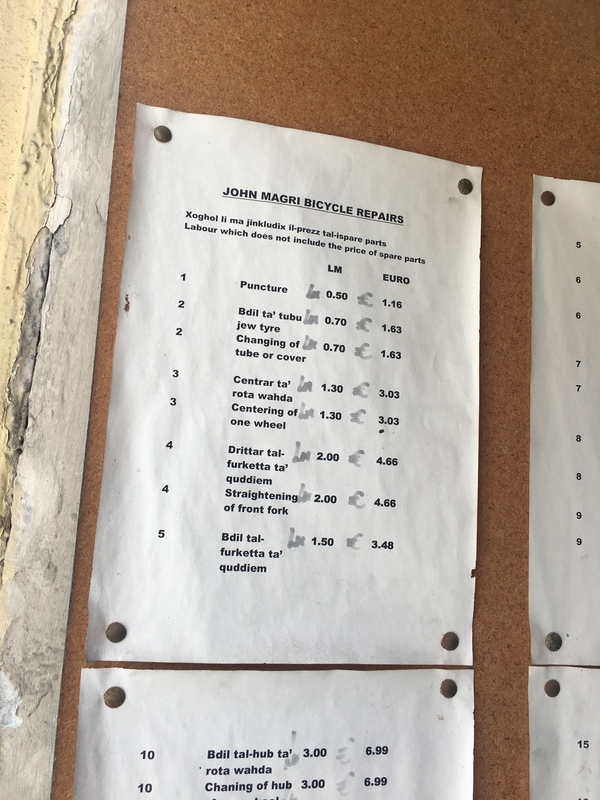 Thanks to Richard Maynard for servicing my bike: it performed magnificently on every stage. 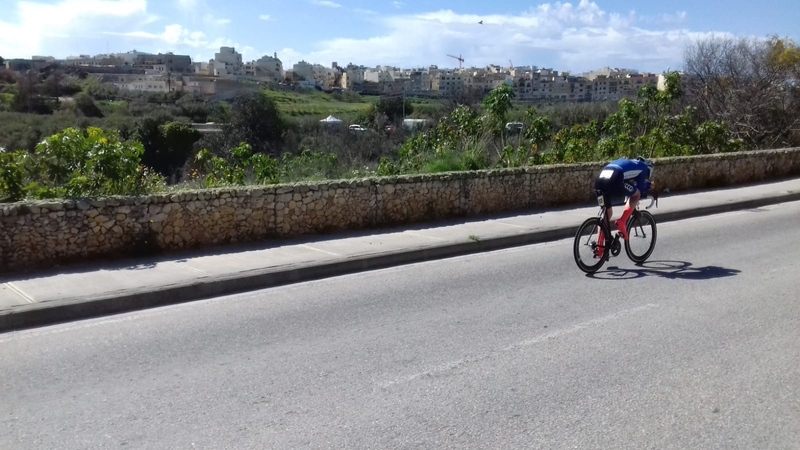 2019 was the Tour of Malta’s 25th anniversary. A great event you all need to think about for 2020. Talk to any of us who have been for tips and details on getting there. You’d all love it! Great to read your reports Martin. Well done to all.